Visiting the ruins of Chateau Gaillard, this is the view the author was shown in visions of the Tower where John Douglas, heir to the Douglas Estates, stayed with his cousin Archibald and younger brother William as part of the exiled Scottish Court. The Scots were under the protection of the French Crown. The tower was in an outer wall and not part of the main structure where King David resided with his queen. One morning while staying in Rouen the author received a vision and then a message: �You should visit Paris today.� Without a map or GPS, the request seemed a little crazy. But Spirit insisted and led the way, turn by turn to the ancient city by the Seine. Entry to the medieval cathedral of Notre Dame was not possible that day so the author started taking pictures of the exterior, backing up to get the right shot, bumping into this statue of Charlemagne in the process. The likeness of the lieutenant standing next to the emperor was the exact image of a man from a Spiritual vision of Guillelmo de Duglas of 795 AD in Piacenza, Italy. 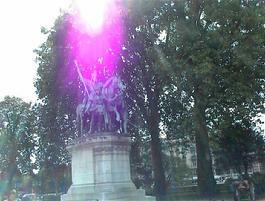 The visit to Paris, the pink heart over the statue image provided physical evidence of Spirit Communication entwined with onsite research. Froissart�s contemporary depiction of the Battle of Crécy in 1346 is from the Wikipedia website. William the first Earl of Douglas claimed he was not at the Normandy battle. The medieval rolls defend the word of Spirit as William�s name is missing. The knight said he avoided the fight and went to Italy. A much later 14th century document confirmed his association with Italy as the Douglas earl provided personal protection to an Italian merchant, a significant action that again substantiates the messages from Spirit, clearing up the mystery of William�s whereabouts until he returned to Scotland around 1348. The cathedral at Rouen... effigy of Richard the Lion Heart on a stone feretory; images seen in visions and found at Rouen. There were additional stories to tell in Rouen but during this first visit, the stories of the "Castle of the Maiden" and the Scottish Court in exile were at the center of the research. William the first Earl of Douglas described a journey to Rouen with King David and his queen that mirrored the location of the ancient medieval manor and cathedral that dominated the village on the Seine. Saint-Saëns was a manor that became part of the Douglas estates in the 14th century. Here is a photo of the 13th century church that served the medieval village. Evidence of this estate among the Douglas charters confirmed messages from Spirit about the marriage of John Douglas to Matilda of Saint-Saëns. Photo from Wikipedia site.